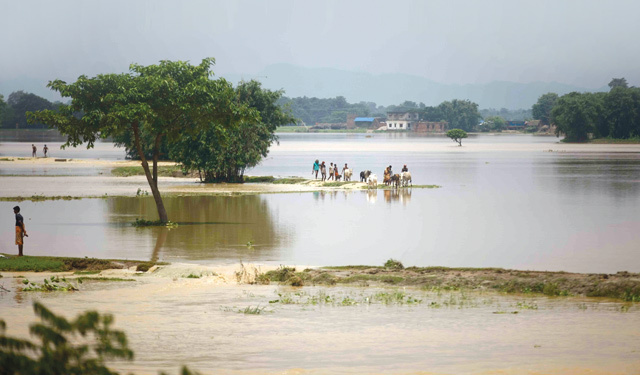 The deaths and devastation caused by this week’s floods in the Tarai were frightful. But what is even more frightening is that this may be just the trailer for even more horrific disasters in the future if we do not manage our rivers right. It may sound like a cliché to say that these were not natural but man-made disasters, but sometimes clichés are more accurate. To understand why these floods are man-made and how future disasters can be prevented, we have to look at the way we are treating our rivers. Rivers are the arteries of the earth, and the roots of human civilisation. Rivers were there before humans came into existence, freely flowing and nurturing plants and creatures in their courses to the sea. In fact, Nepal’s three main rivers are older even than the mountains, carving through these mighty gorges over the last 65 million years as the Himalaya rose. But we have desecrated these sacred veins of water. We have exploited them for water, irrigation and energy but also for sand, gravel, boulders and other construction material. We think we can tame rivers by building embankments, or dam them to get rich. But the rivers are fighting back. There are more than 6,000 rivers and rivulets in Nepal, but we have never cared about managing them sustainably. Isn’t it bizarre that a country with so many rivers does not have a long-term policy or vision to use its resources without destroying them in the process? When our policymakers discuss rivers, they cannot think beyond sand mining, gravel excavation, sewage or hydropower. Rivers are not just for these commercial purposes, and it is not a sustainable way of managing rivers. Removing sand and boulders from the rivers increases the velocity of the water, making them more destructive. Building embankments and encroaching on the floodplains constricts the rivers, squeezing them so they cannot handle runoff after heavy rainfall. To manage rivers sustainably, it is important to let them take their own course and flow freely. Rivers are supposed to be holy here, but we have destroyed their sacredness. A river in which you cannot swim, drink or fish is a dead river. The Bagmati, despite the clean-up campaigns, is near-death. It has been straight-jacketed, it is a dumping ground and a sewer. If rivers mirror our well-being as a society, the Bagmati proves just how toxic we have made our own city and country. The putrid odour of the Bagmati is the smell of the greed and selfishness of a decaying society. Nepal’s official policy never reflected the respect we need to accord our rivers. Just like the exploitation of the Chure, we have mistreated and abused our waterways. The rivers are now seeking their revenge, and we have pushed them to unleash this disaster. Better late than never, we must start a dialogue to preserve rivers, managing them sustainably and preventing future disasters. The 17th Bagmati River Festival on Saturday is an annual ritual to commune with the holy waters that nurture the Kathmandu Valley civilisation. For the last 17 years, the festival has aimed to raise awareness about a problem that has become much more grave in that time. The Bagmati River Festival is not just about the Bagmati, but aims to draw attention to the degradation of sister rivers all over the country. The key message is: Don’t mess with rivers, or they will mess us up. Megh Ale is a river conservationist, and has been organising the annual Bagmati River Festival since 2001. Cherie Booth to the rescue. 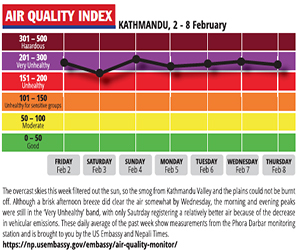 Theres plenty wrong with rural health care in Nepal-lack of political will, a stifling bureaucracy, and poor awareness. Then again, some things are going well. There are simply not enough doctors in rural Nepal. But one lucky district hospital doesnt value those it has.